--Give students written prompts for all assignments. Don't assume that students have correctly processed your oral instructions about what to do or that they'll accurately remember what you've said. --Don't assume that students will understand any complicated language in your assignment prompt. Think about using the clearest language possible and/or defining any potentially unfamiliar terms in parentheses. If students can't understand what you're asking, they're going to be unable to deliver a useful answer. --Include guidance on stylistic preferences in your field in your essay prompts. E.g., if your field prefers the passive voice and eschews the use of "I" and "we," let students know! --Provide students with written models of what elements of each assignment should look like. Sample thesis statements, lists of arguments, topic sentences, and conclusions (and/or other important elements) can be very helpful to students who may not picture the same thing that you do when you discuss these elements. --Include written models of what in-text citations look like in your field. --Include written models of sample Works Cited/References/Bibliography entries in your field. As undergraduates, students typically do work in several different disciplines. Don't assume that they'll automatically know how to format their references correctly in your discipline, particularly not in first- or second-year courses. --If you're sending students to the Writing Center, please urge them to bring a copy of their written essay prompt so that our tutors can try to ensure that your students are meeting the requirements set out in the prompt. 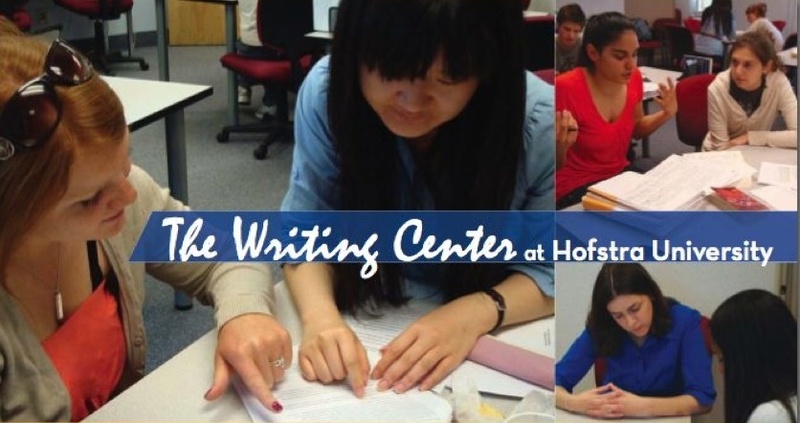 --If you plan to send many students to the Writing Center for help with the same assignment, you might want to e-mail us a copy of your prompt at engdsm@hofstra.edu and englmd@hofstra.edu so that we can distribute it to our tutors. --If you're sending students to the Writing Center for help revising papers on which you've already commented, please encourage them to bring your comments with them so that our tutors can try to ensure that your students focus on the changes you want them to make. Please don't hesitate to contact us (at engdsm@hofstra.edu and englmd@hofstra.edu) if you have any questions about how to make assignments clear to students -- we'll be glad to try to help! Extra Grammar Help Now Available at the Writing Center! Are you puzzled about grammar? Unsure of the rules? You can try an appointment with Kate, Ben, Sarah, or Jen M., who have all volunteered to provide extra grammar help to writers who wish to focus on these issues. If you have a particular grammar issue in which you are interested, note that on your appointment. Keep an eye out for forthcoming grammar workshops as well! More Good News About Reading: If You Read Good Literature, You'll Get Better at Figuring out Your Fellow Humans! Reading won't just make you more empathetic and smarter (see post below). According to Tom Jacobs's "Jonathan Franzen can help you read people: New research suggests reading literary fiction increases our ability to pick up on the subjective states of others," if you read literature, it will also help you understand what other people think and feel. So pick up a good book, and you could start improving your real-life relationships at the same time!